South Sudan's President Salva Kiir, who launched the national dialogue committee in Juba, May 22, 2017, has announced he will not serve as 'patron' for the process. South Sudan's President Salva Kiir is no longer running the national dialogue. Dialogue co-chairman Angelo Beda said Thursday the president relinquished his position as “patron,” and the process is now in the hands of all South Sudanese. The president initiated the dialogue late last year, saying it would end the ongoing conflict and address other problems facing the country. Many observers inside and outside the country criticized Kiir's decision to put himself in charge of the dialogue he announced in December. Beda said when the president swore in the 92-member steering committee late last month, he decided to give up his role as patron so that citizens would have more faith in the process. “He has relinquished patronage over this process because of the criticisms that have come around, and has left it free for us. We the two chairpersons should see to it that we are the ones moving with it ahead,” Beda said. He said he and Abel Alier, the other co-chair of the dialogue's steering committee, will open the process to all South Sudanese, so they can speak out honestly and without fear. “To talk about the grievances all over among the 64 tribes, either with the government or among themselves. They are going to discuss the war, they are going to discuss the conflicts, they are going to discuss the killings either for cattle rustling or for land or by the government's army, which is supposed to protect us and is killing us,” Beda added. Beda said the president has taken other positive steps to create a conducive environment for the dialogue, including changing the leadership of both the army and the ministry of finance, and releasing political detainees. 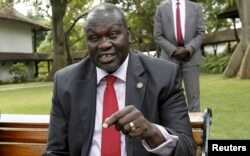 But he said President Kiir also should extend an invitation to rebel leader Riek Machar. South Sudan's rebel leader Riek Machar speaks during an interview in Nairobi, Kenya, July 8, 2015. “Although he has said Riek specifically should not come, we are not going to lose hope. There are many things he said he wouldn't do and he did them through persuasion,” Beda said. Addressing religious leaders in Juba Thursday, Beda said faith groups have a key role to play in helping South Sudanese reconcile and heal their grievances. Reverend Apolo Alfred, secretary general of the Africa Inland Church of South Sudan and Sudan, said religious leaders are more than happy to deliver the message of peace throughout South Sudan. “As soon as we go out of here on Sundays we shall convey the message of peace, the message of reconciliation, the message of unity, the message of oneness of this country, the same people, the same brothers and sisters. If there's something we share and talk it over as children of one family,” said Rev. Alfred. Joseph Marial, director of education at South Sudan's Islamic Council, says his faith also promotes peace and reconciliation. “We want our people to come together with our Christian brothers and others who don't even have a religion. We want peace to be in the whole country,” Marial said. Roy Samson, a member of Mothers' Union at the Christian Brotherhood Church in South Sudan, said religious leaders should do their best to reach all the people of South Sudan, and the government should secure the states outside of the capital. “They say we have to deliver the national dialogue to all the areas in South Sudan all the way down to the grassroots, but now even me myself I cannot reach my village because of insecurity; all the roads are blocked. You cannot go even to the nearest place outside of Juba,” Samson said. When the national dialogue's steering committee was sworn in, it signaled the official launch of the dialogue. Grassroots, regional and national meetings and consultations are expected to begin soon.